Blogger Des Moines Art Collector wrote recently about wanting to see into a painting of a tree, not just see the surface. So while I painted this weekend, I took some photos showing one way to do that. 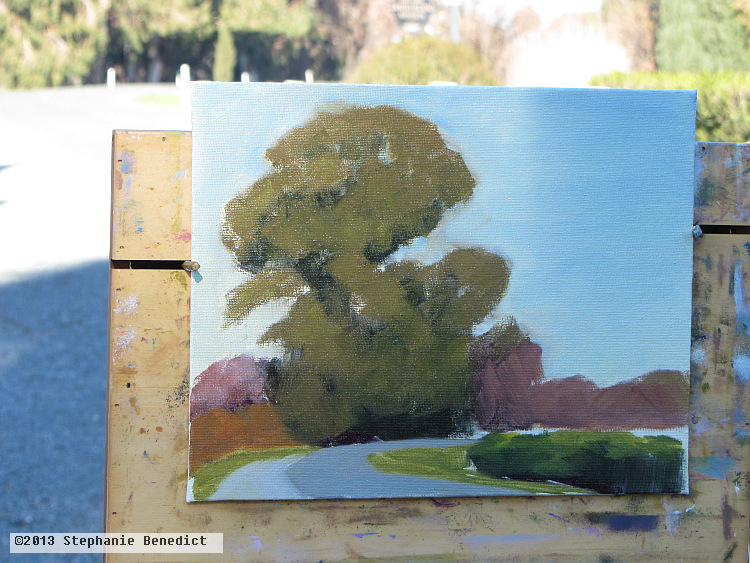 Delta Eucalyptus at the end of a plein air session. It will need some touchup when it’s dry. 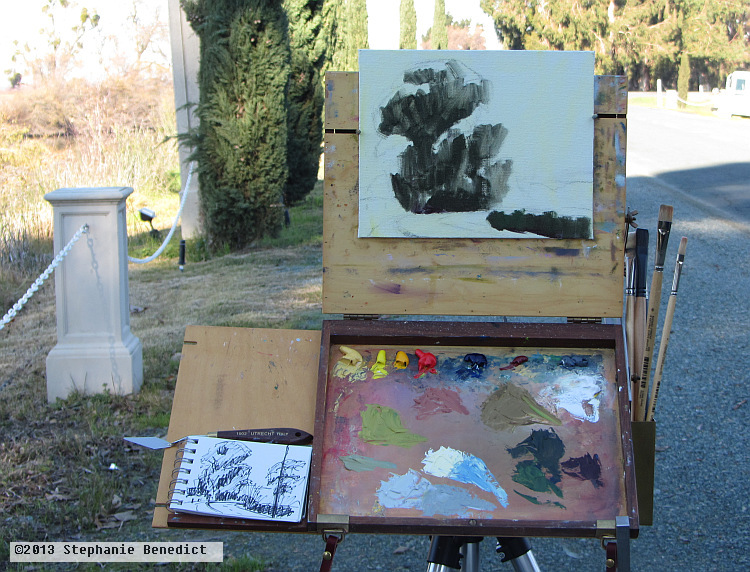 I was out with painters from the Sacramento Plein Air Painters Meetup group in the Sacramento River Delta. The Delta is famous for its narrow, winding roads on top of the levees that both protect the islands from floods and cut off their source of new soil—silt from those same floods. It’s not unlike the situation in New Orleans. We had a beautiful January day by the historic Grand Island Mansion. 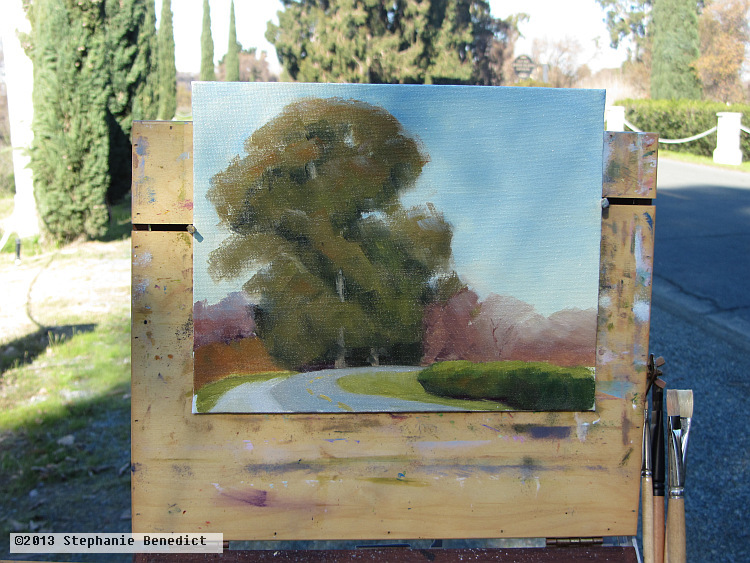 We pulled off in a rare wide spot by the road and set up our easels, where this eucalyptus tree called to me to paint it. 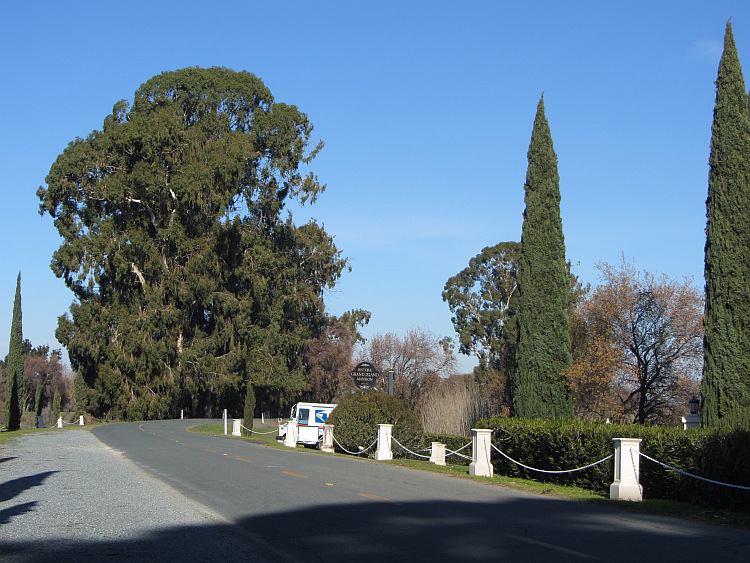 The scene for Delta Eucalyptus. Minus the postal service truck! This technique for painting the different layers of trees I learned from Terry Miura. Usually painters are taught to think of trees as shapes: cones or ovals or balls. But because there is shadow inside a tree, as well as any cast shadow on the outside, you first have to paint that interior shadow. First I painted the shadows inside the tree with a thinned dull blueish-purplish-greenish color. This shot shows the painting at an intermediate stage. What do you think? Do you have a technique for painting the interior shadows of trees? For exactly the same reason I breathe. How long hasn't there been any answer? As long as I can remember. And how long have you written? Tell me, doesn't your painting interfere with your writing? Quite the contrary: they love each other dearly.